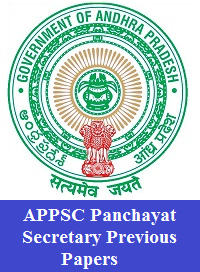 Download all the APPSC Panchayat Secretary Previous Papers subject wise from this page. Higher officials of the Andhra Pradesh Public Service Commission (APPSC) had announced the exam dates. The scheduled dates for the Screening Test is 21st April 2019, and the Mains Examination is to be conducted tentatively on 2nd August 2019. In the upcoming sections, you can note down the assigned psc.ap.gov.in Selection Process 2019 together with the ఆంధ్ర ప్రదేశ్ పబ్లిక్ సర్వీస్ కమిషన్ Exam Pattern 2019. Furthermore, you have to download the APPSC Panchayat Secretary Model Papers in PDF format with the help of the direct links given at the end of this page. Check out the below given Andhra Pradesh PSC Selection Process 2019. Within this, the recruiters of Andhra Pradesh Public Service Commission (APPSC) will hire candidates who are suitable and talented. Candidates who are ready to take part in the recruitment process must refer to this section. Well, this section clearly provides you with the latest APPSC Screening Test Pattern 2019, Mains Exam Pattern 2019. To attempt the test more comfortably aspirants must know the structure of the paper with the suitable psc.ap.gov.in Screening, Mains Exam Pattern 2019. Below are the patterns are given in the below will be very helpful during the preparation process. Remember, that you must complete your preparation before the test date. Well, all the aspirants must initially look at the syllabus topics, the subjects that are in need to be prepared for the test. Then, they must move on to the concepts which have heavy weightage. After that, you must download the subject wise APPSC Panchayat Secretary Previous Papers PDF available free of cost from this page. Practice all the questions given on that APPSC Panchayat Secretary Model Papers PDF. Hence, you can know how much you are strong in the topics. Soon after referring to this page, candidates must and should download the given APPSC Panchayat Secretary Previous Papers PDF’s. Freshers Now which is the single destination where you can find only the updated information of the latest Govt Jobs, Syllabus, Previous Papers and also the Admit Cards, IT Jobs, Results and many more.